When the baron swept into the first bends on the narrow mountain road, he somehow felt he was experiencing the beginning of a legend. He continued to drive along the dusty roads of northern Sicily toward Caltavuturo, passing colourful carretti siciliani (Sicilian carts) and cheering spectators along the way, as he made his way up and across the curving mountain route towards Collesano. He entered a final straightaway, with the breaking surf of the Tyrrhenian Sea on his right, and then pointed the car with the elongated nose once again in the direction of the small town of Cerda; where the circuit course ended after 72 kilometres of high-speed driving. However, the torture he was putting himself and his vehicle through didn’t end until he had completed another nine laps. 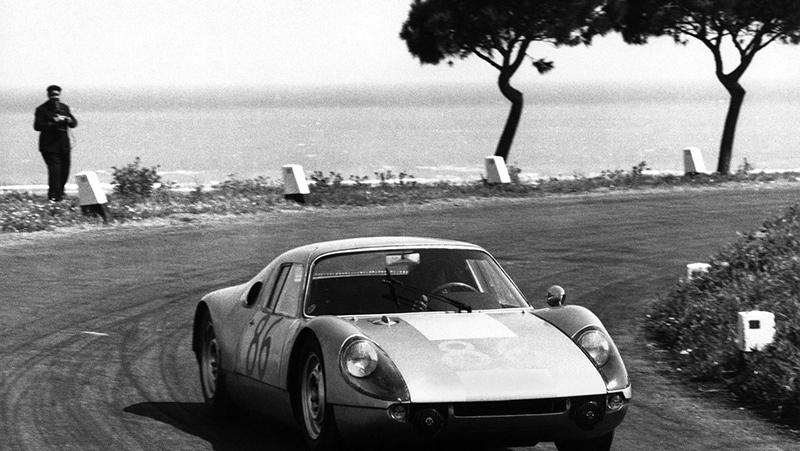 Baron Antonio Pucci and his passenger, Colin Davis, ended up winning the legendary Targa Florio race of 1964 after seven hours and ten minutes of driving at the absolute limit. The car the Baron drove was a silver Porsche Carrera – the first Porsche to have the legendary GTS designation added to its name. Power, reliability and speed have always been the defining characteristics of outstanding sports cars. The comfort of the drivers became a decisive factor to let them stay completely focused for the whole duration of the race, especially in exhausting long distance competitions being held on public roads. In other words, a new type of vehicle had to be developed – one that would be fast, but also safe and comfortable. The engineers from Zuffenhausen answered the call with the Gran Turismo Sport (GTS). A lot has happened since then. For one thing, the meaning of the GTS classification has changed: Whereas the three letters initially stood for additional comfort in a hot-blooded sports car, they eventually came to serve as a label for an even sportier driving experience that would also offer what was now a customary high level of comfort. These days, all Porsche models are available in an extra-sporty GTS variant that features a typical array of trim details. For example, the interior refined with black Alcantara, is an expression of sports purism, while the red-shaded tachometer clearly identifies the vehicle as a race car for the road. Experts would be able to recognize a GTS just by the accentuated, colour-offset seams on the bucket seats – were it not for the embroidered GTS lettering, which clearly reveals the true character of the model, even to the uninitiated front passenger. A GTS model’s sport suspension gives it a much lower stance on the road than normal. The vehicle’s more striking front apron – adapted from the turbo model, the black dual tailpipes of the sports exhaust system, and headlights framed in black are clear distinguishing features for the well versed Porsche ‘taxonomist’. Black is in fact a defining element throughout the entire GTS design concept. For example, a silky black finish is usually a characteristic feature of the lettering, radiator grille, and wheels on a GTS. The combination of such black tones with the typical lush-red GTS body creates a sharp colour contrast that is a hallmark of uncompromising sportiness. Nevertheless, one’s true values are always those of the heart, and this old adage applies equally to bold and proud sports cars like the GTS models. Indeed, no deep analysis is required to identify their genuine sporty character. The Porsche Active Suspension Management (PASM) system ensures straightforward dynamic handling, while a sports-tuned engine guarantees a gripping driving experience. The Sport Chrono Package in the GTS models results in roughly 15–30 hp additional output as compared to other members of the model family, and higher torques and maximum speeds ensure these top-class sports cars will have a decisive advantage in any ‘family duel’. The current GTS portfolio begins with the Boxster and Cayman; the racing roadster is actually the first Boxster to achieve a top speed of 281 km/h. 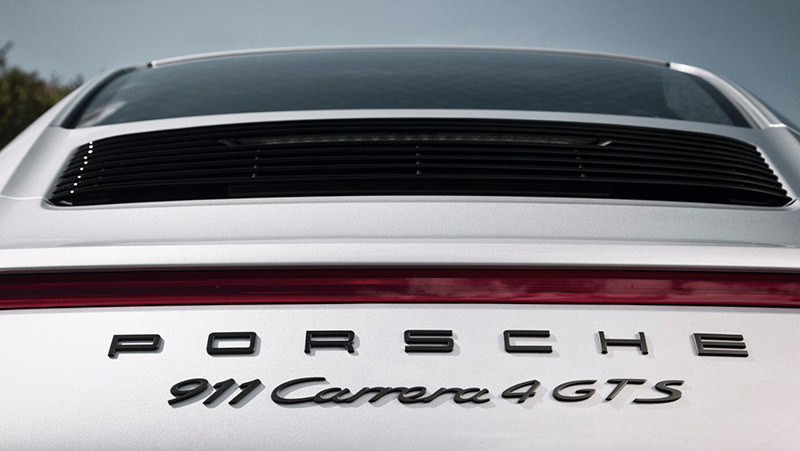 The 911 Carrera and 911 Carrera 4 are also available as GTS variants – and of course it wouldn’t be proper to exclude the Panamera and Cayenne from the party. The 911 Targa 4 GTS, which just recently celebrated its premiere at the Detroit Auto Show, is the newest member of the GTS family. To this day, reliability and speed continue to define the character of a GTS. The original meaning may have been reversed over the decades, but the three letters have nevertheless always stood for ‘a lot more’. In the beginning, GTS meant more comfort in a full-blooded race car, while today it stands for an extra portion of sportiness with the same outstanding level of comfort. The history of the Porsche GTS models began in 1964 at the Targa Florio in Sicily; the story has reached its high point today in the form of the 911 Targa GTS. The tight curves on the road to Collesano, the straightaway along the Sicilian coast – all of it would be just as much a pleasure to drive with the latest addition to the GTS family.